A study published in "Stroke" in 2011 showed that over a period of 10 years, people who ate more white fruit like apples, pears and bananas had a lower incidence of stroke than those who ate more of other colors of fruit. 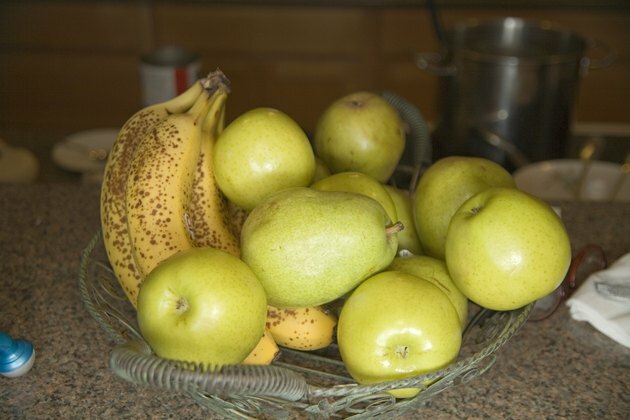 Apples and pears were the most commonly eaten white fruits in the study. A medium apple that is 2.75 inches in diameter contains 72 calories. The apple is made up of 19 grams of carbohydrates and 3 grams of fiber and no protein or fat. One medium pear has 96 calories that come from 26 grams of carbohydrates, 5 grams of fiber and 1 gram of protein. A medium banana is about 7 inches long and is 105 calories. The calories come from 27 grams of carbohydrates, 3 grams of fiber and 1 gram of protein.